Since my last blog post, we‘ve been progressing with preparation for the changes to the MOT that will come into effect from 20 May 2018. We’ve also made improvements to data within the ‘Check the MOT history of a vehicle’ service and improved the way we do garage risk assessments. Over the past few months, we’ve been working hard to design how testers will need to pick the defects after 20 May. This needs to change from the current service because of the new defect categories – but we have tried to minimise the change. To make sure this area works for testers, we’ve done a lot of research with them on the screens to make sure they are easy to use. You’ll just need to pick the defect description that matches the defect on the vehicle as some types of failures might have both ‘dangerous’ and ‘major’ defects. We’re also building a prototype area for testers to try these new screens within the MOT testing Service. This means that testers will be able to try the new screens before they become ‘live’ on 20 May. We will let you know more when we make this available in April. As you’ll have seen, the new MOT inspection manual is organised slightly differently and a lot of the wording has changed. To make it easier to find defects, we’ve improved the ‘search’ function. This means you can find the defect you want to record if you’re not sure which section of the manual it’s in or the exact wording. We’ve had lots of positive feedback about how easy this is to use, so I hope you’ll find this useful. Over the past few weeks, you’ve given us a lot of feedback on hand-typed ‘manual advisories’. Many of you told us you use free text, because there aren’t enough of the right pre-defined advisory defects available. So, we’ll be adding a number of new ones, related to MOT defects, to cover this. These are based on the feedback you gave us and will be in place from 20 May. We’ll assess your feedback on these and can add any that we've missed. Once we’ve covered all of the needs for ‘free text’ advisories, we’ll consider removing that feature. This will improve the consistency of information we provide to motorists and avoid the need for testers to type as much as they do now. We’ve had some helpful feedback on the proposal of 'observations', and will be looking at this more when the new roadworthiness directive changes are in place. The team has also been working on creating new training materials to cover the roadworthiness directive. You’ll be able to find these on GOV.UK from the end of March. We know that different people like different types of training materials so there’ll be web content, video and presentations available. We’ll add to this as we get feedback from you. Also, you’ll be able to use this material for next year’s annual training, which includes the directive changes. We’d encourage you to do this training as soon as the new training year begins on Sunday (1 April 2018), to avoid rushing at the end of the year. This will also help to make sure you fully understand the changes before 20 May 2018. Further details of the syllabus will be available on GOV.UK on 1 April. Back in November, we told garages about the changes that will need to be made to smoke meter settings from 20 May. Since then, we’ve worked with the garage equipment manufacturers to make sure that they understand the changes that need to be made, so they can make them in time. Some of you will have already found that not all equipment models will be able to be updated. So some of you will have to invest in new equipment. To try and make things clearer, the Garage Equipment Association has published a list that shows which types of equipment can and can’t be updated. 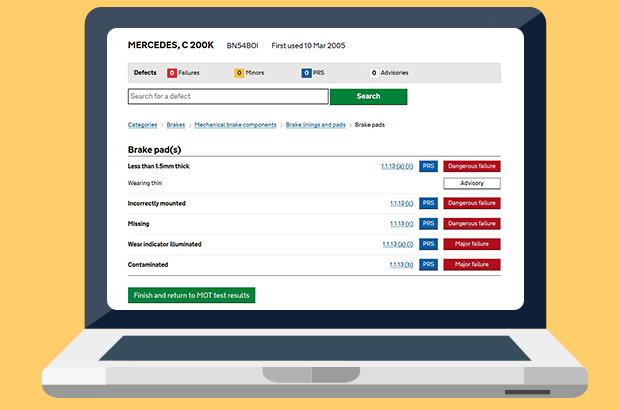 Something else we’ve been working on this month, is adding heavy vehicle (HGV and PSV) data to the ‘Check the MOT history of a vehicle’ service – and that will be available publically in April. Many of you told us through feedback that you’d find this really useful, so we’ve added it in. We’re now working on adding HGV trailer data to the service, and we will then move to extending the ‘Get MOT reminders’ service to include heavy vehicles. As always, we like to hear your feedback when we add new things into the service to make sure they’re working well for you. In previous blog posts, we’ve let you know we’ll be improving the way we rate garages in terms of the risk they present to test quality. We’re looking at our new approach to risk rating being driven by 3 main areas – analysis of our data, a site review and outcomes of DVSA checks. At the moment, we’re trialling the different parts of this and expect to make the changes in the summer to make sure that we use our resource better. We’ll use our data to identify unusual trends. We are piloting this now and we’re already finding, and dealing with, some garages doing poor or fraudulent testing. Also, we’re also trying a new approach to a ‘site review’ to replace the current site assessment. The key changes we’re trialling will narrow the assessment down to the things that materially affect test quality. This will make it shorter and more focused than it has been in the past. We’ll continue to test with different garages over the next few weeks, and will let you know how we get on and when our approach will change. Just been admonished by DVSA inspector for incorrect brake test. Told I should apply brakes like a four stone granny not use maximum effort. Also told to use manual advisory for brake imbalance. Where’s the consistency? Been trying to get a response on software readiness for our emissions tester, no email reply or return call back from DVSA on it. Our smoke meter manufacturer (SPX Solutions) haven't released an update yet, they've now said that they've been given special dispensation by DVSA until September, is this true? Today is 19 May 2018, the new manual is on the website http://www.mot-testing.service.gov.uk/documents/manuals/class3457/ with a publication date of 20 May and a last updated date of 20 May 2018. How are testers meant to know if there have been changes if you disregard basic document control standards? we need some clarification on the new emissions limit that meant to be on the vin plate, i've noticed that some cars it's there i.e volkswagons but on other cars it's not but there is a sticker stuck randomly to either the slam panel or the bulkhead or even the bonnet hinge that has the figure in the square box. now the literature from dvsa says only to check the vin plate for the figure so do we ignore this sticker if theres nothing on the vin plate and go off the pre-defined limits, or do we have to use this sticker reading despite it not being on the vin plate as advised by dvsa? A 2014 Vehicle is tested after 20th May, Reverse lamp doesn't work ! Pass - Fail - Advise - Major - Minor !! Which is it ? If, it is as I read it, a Minor - why bother adding reverse lamps in the first place ? And, why has the reverse lamp switch been added ? At what point during a test are we able to "diagnose" a switch fault ? If anyone fails a vehicle for a "Reversing lamp switch not operating in accordance with the requirements." and the vehicle owner purchases a new switch and perhaps pays someone to fit it and it doesn't fix it - who is liable ? when it turns out to be a blown fuse/wiring issue ! HASSLE, THINK THESE THINGS THROUGH. THERE SHOULD BE A DEFINED CUT OFF/START TIME. With the requirement for all vehicles first used after 01 Apr 91 and over 2100mm wide to have end outline lamps, does this measurement include the wing mirrors or is it just the body width? Just to clarify what i have just read! you cant have different sized tyres on the same axle but now its ok to have a space saver on a vehice being tested? its now a pass and advise? The issue here dvsa is we the current mot testers of this land Demand to keep the manuel advisory section ! Dont remove it please! What is criteria if you have a diesel vehicle in and it starts to dpf regenerate during test ?, does it automatically fail ?,. How do we deal with EGR blanks? One question about the diesel emission levels as found on the "manufacturers plate" I seem to see a lot of cars with no limit on the vin plate, but a separate small sticker under the bonnet with a number in it. Is this definitely the value to put into the emission tester? Or is it back to the default values? how is it going to work with retests which have been done before the 20th of May and then turn up for a retest after the 20th of May if you have ADVISED say the EMT is on and has passed the emissions but after the 20th of May the light on will be a fail.